If you think the Queen & Gladstone district sounds sweet, just wait until you move into your new Twenty Loft! 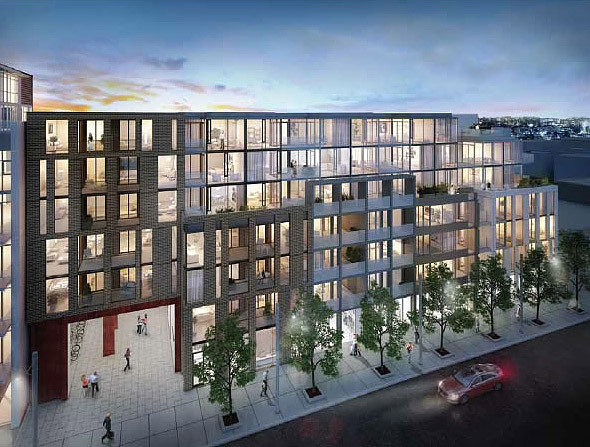 Located in Streetcar’s vibrant Queen and Gladstone district, this seven-storey boutique building will offer 128 lofts for the modern urbanite.TWENTY residents will “walk the row” to ground level boutiques, studios and a Metro grocery store located conveniently onsite. Easy access to a full gamut of amenities, including an impressive outdoor lounge, state-of-the-art fitness centre, modern indoor party lounge, guest suites, and a fantastic new urban park. Introducing TWENTY by Streetcar, a striking new seven-storey building created in proud partnership with Dundee Realty offering 128 stylish lofts at Queen & Gladstone, in the very heart of the flourishing Queen West scene. Designed by TACT Architecture, TWENTY LOFTS by STREETCAR takes the form of a modern, urban, light-infused, beautifully articulated seven-storey boutique mid-rise building. TWENTY’s diverse façade combines brick,terracotta, metal panels, concrete, glass and steel. Outdoor terraces and balconies add even more character to the bold exterior. TWENTY LOFTS completes the Queen & Gladstone district vision with a pass-through connection to the laneway and shared shopping, services and amenities. This fusion allows for an animated pedestrian culture and a street level expression that honours the spirit and scale of the neighbourhood. Expect an amazing living experience, courtesy of everything TWENTY and the Queen & Gladstone district offers. Here’s a place where you can hang out, meet people, host friends and family, work out, get stuff done and hop on the TTC – all within steps of your loft. And, of course, you’ll live in the heart of the Queen West scene! TWENTY offers an impressive collection of amenities, shopping and services – all located conveniently onsite. Host a BBQ or party on the outdoor terrace for your friends! Relax, exercise and have fun in a new urban park, anytime. Experience everything the Row has to offer! Chic guest suites to host your own out-of-town visitors. •Underground access to Metro grocery through the parking lot. If you think the Queen & Gladstone district sounds sweet, just wait until you move into your new Twenty Loft! Streetcar’s signature combination of modern architecture and functional design is in full force at TWENTY, which offers a refined authentic architectural interior design approach with highly livable layouts and simple, bold and beautiful finishes. Exposed concrete nine-foot ceilings, handsome hardwood floors throughout and frosted sliding glass doors set the tone. High gloss, European-style kitchen cabinetry features streamlined design elements and integrated appliances and hardware. Caesarstone countertops and backsplashes have been mixed and matched to complete the slick, clean look. The end result? A stunning loft to decorate and make your own!